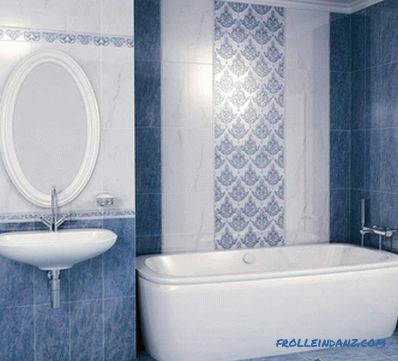 For many years, tile has been considered the best option for finishing bathrooms and sanitary facilities. Thanks to innovative technologies, manufacturers can produce high-quality materials with high performance, as well as an attractive appearance. 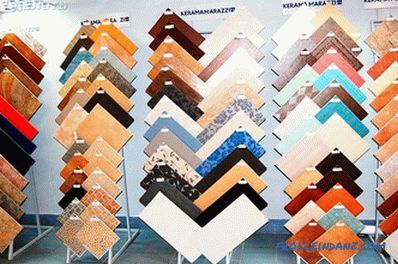 A rich assortment makes you think about which tile to choose for the bathroom, which one is better to choose color and size. To make the right choice and perform a quality repair, which will delight over the years, you need to know about all the requirements and specifications. This will be discussed in this article. 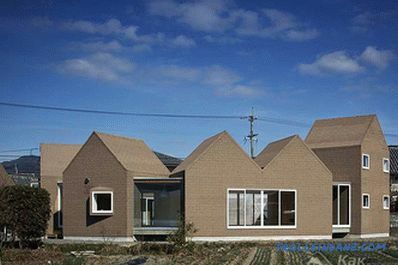 The tile contains clay and water, so you can safely say that it is a natural material. Bicotture. It is subjected to double firing and glazed. Despite the high resistance to aggressive detergents, it has reduced strength. However, this is a great option for wall decoration. Monocottura. 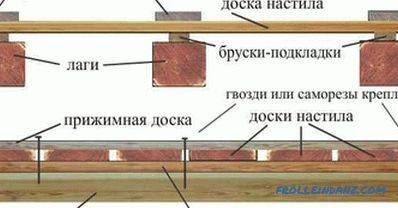 During production, the workpiece is fired 1 time. The result is a high-strength material that can be laid on the floor. Clinker. 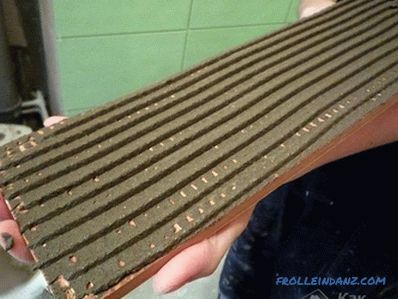 This is a common variant of ceramic tiles. In the production process, innovative technologies are used that allow to obtain a low-porous and durable material. However, there is only one minor drawback - the limited design: there are only natural shades. Porcelain stoneware. Rugged floor tiles have high resistance to abrasion and scratching. In most cases, porcelain tile manufacturers create imitations of natural stone: granite or marble. In addition, there is a rough surface, which gives the tile greater similarity with the original. Glass and mirror. Moisture resistance and durability are as high as that of ceramics. In this case, the disadvantage can be called susceptibility to shock loads. Therefore, it trim walls and ceilings. Polymer. This is one of the most affordable options that anyone can afford to buy. 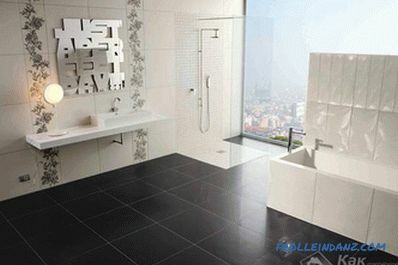 Diligent manufacturer offers its customers a variety of tile designs. Natural stone. The most expensive material is real stone. Thanks to modern equipment, it is possible to carry out precise cutting of the stone and process it to the standard tile dimensions. If there is a thin layer of glaze, tile resistance to abrasion decreases therefore, this tile is recommended for wall decoration. A foot on a black background means that this tile can be used for facing the floor. The shaded background indicates increased wear resistance. The silhouette of the palm on a black background means that the tile is designed for wall decoration. The image of the flask and the abbreviations indicate a high resistance to the action of aggressive substances. A gear with numbers indicates the degree of wear resistance. In a residential building, the coefficient of 2 is quite sufficient, since at home everyone walks barefoot or in soft slippers. Also be attentive to the information on the thickness of the product, which is present on the label, and the anti-skid coefficient. The last point is very important in the house where there are small children. When finishing a bathroom in a private house or apartment, it is recommended to buy tiles with an AA stability indicator. 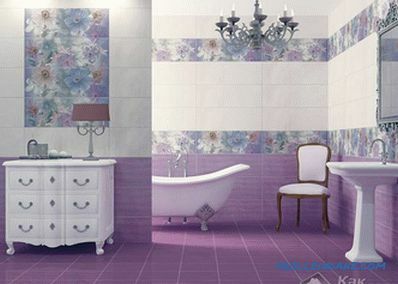 You should not give preference to several colors of the tile, which is in different collections, at the same time, since such a tile will not harmonize enough with each other. Each collection offers many options for decors and inserts that are made in the same style direction. It is also important to follow another tip - this is the allowed number of colors when bathroom finish. The best option is a combination of 3 primary colors, as well as their shades, which include the color gamut of all surfaces and decorative elements. A large number of colors will act on the eyes too tiring. In addition, this is a bad decision for a small bathroom, as the room will look coarse. In the process of combining several collections or elements from different manufacturers, you should know the dimensions of the tile exactly. 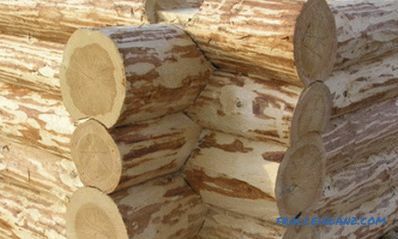 Since they can differ not only in size but also in thickness, which will cause difficulties in laying. Green. This is a traditional bathroom solution. This color has a positive effect on mood and invigorates in the morning, which is very important. Blue. Used when you want to create a solid interior. At the same time on light colors even small impurities will be immediately noticeable. Do not forget that it is a cold shade and many will feel discomfort. Red. Shades of this color act excitingly and increase the general tone. Orange. Such a room in the subconscious of a person will be associated with the sun, which means that he will lift his spirits and arrange for a good start to the day. Lilac. Perfect fit in the girl's bathroom. 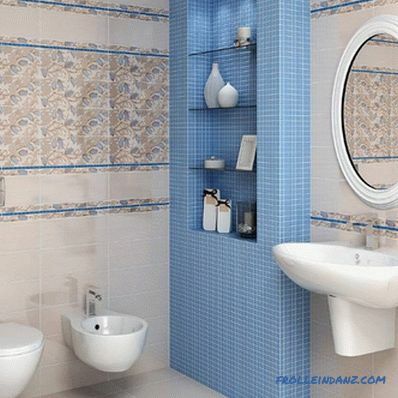 When combined with other colors, such as red or blue, it is suitable for a family bathroom. Black is considered a classic design and white, as well as their shades. Designers recommend using high-quality branded tiles in this case. In addition to the above information , decide which is better to buy a tile in the bathroom, will help other important characteristics. If the selected finish has a high moisture absorption rate, its weight will be increased several times, so the adhesive solution will not be able to hold it on the wall. In time, it will disappear. You can determine the degree of absorption by yourself; it’s enough to inspect the wrong side for the presence of pores. Ideally, they should not be there. The reverse side of the tile has a hollow. When laying it is very important to completely fill the void with adhesive solution. Otherwise, a cavity is formed, which will affect the adhesion of the finishing material and the wall. uniform distribution over the entire surface. 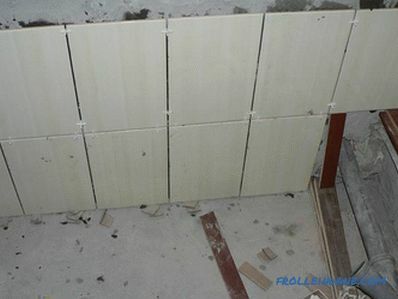 It is enough to thoroughly inspect and probe the tile to determine the presence of the specified parameters. 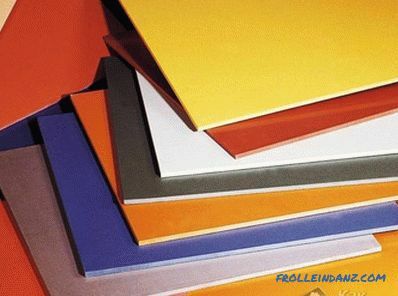 Consider that manufacturers make tiles with a matte or glossy surface. Each of them has its advantages. In order to make tile laying qualitatively, it is very important to select elements with the correct geometry. In this case, all seams will be smooth and clear. 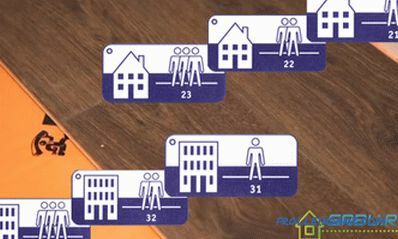 To check this figure, it is enough to put a few tiles on the side of the pile on a flat surface. If the upper edge of the tiles will not coincide with each other, this means that there are drops. 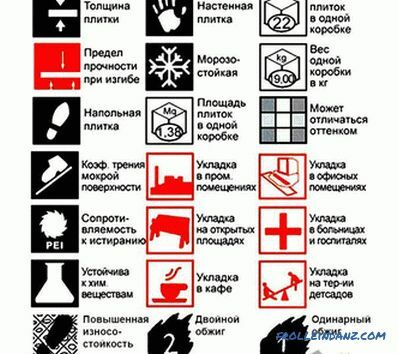 Even minimal differences of 1-2 mm translate products into the category of defective products. Acquire it is not recommended. Large tile. Its size is 25 * 40 cm over. 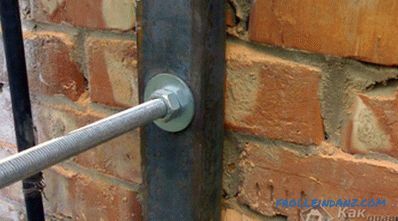 Due to the large size, the level of moisture resistance of the walls increases, as with its laying fewer seams are formed. However, if the walls are not perfectly smooth, then it is difficult to level the curvature with such tiles. 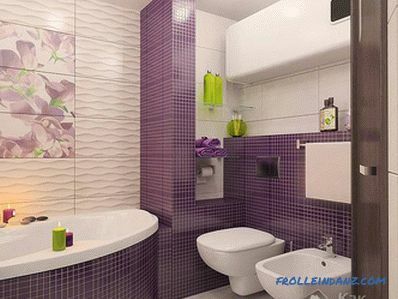 Installation of large tiles visually increases the bathroom space. Medium tile. Its average size is 20 * 25 cm. If the bathroom has a small area, then this is the best option. For example, making a laying vertically, you can visually raise the ceiling, if horizontally you expand the room. The small tile does not exceed 10 * 10 cm in size. It is best to use it if you need to hide the curvature of the wall. Small tiles are best laid in large bathrooms, but be sure to combine with other finishing materials. Square tiles are often used to create patterns on the floor and walls. The mosaic tile consists of small squares, hexagons, it can even be oval. Most often it is used when facing the shower tray and other surfaces. It is considered that for large rooms the tile of a small format is most often used. A large tile visually increases the room due to a small number of seams. 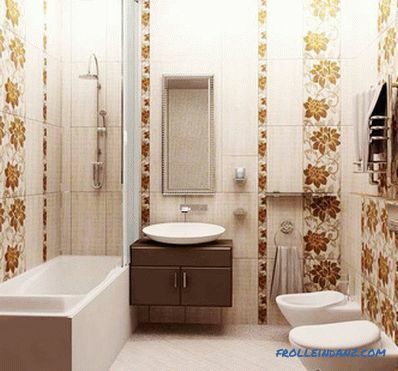 Therefore, if you have a small bathroom or medium size, then choose a tile of large sizes. But keep in mind an important condition: when laying large tiles, the walls should be smooth. 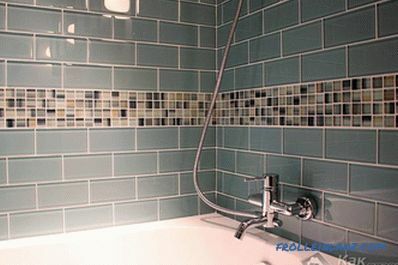 If the bathroom has niches, hollows or shaped projections, then it is better to purchase mosaic tiles. 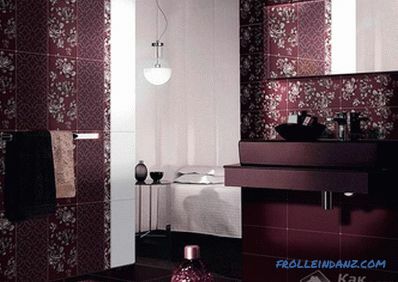 Also in this category can be attributed to non-standard tile size with ornament type decorative border. They can be separated functional areas of the room. Consider the size of the bathroom. 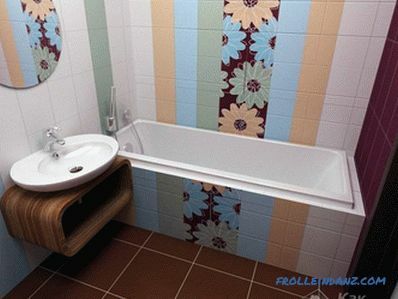 For a small bathroom tile should be larger than for spacious. A large tile in a small bathroom narrows the space visually. As a result, a feeling of closeness. 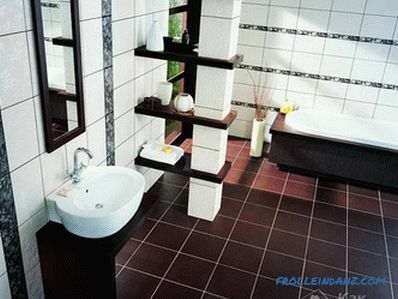 Therefore, for a small room, you can use tiles of medium size. 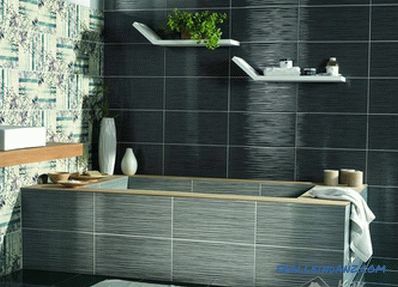 When arranging a spacious bathroom, you can combine tiles of different formats, for example, large and mosaic. These are, perhaps, the main nuances that should be repelled when choosing a tile in size. 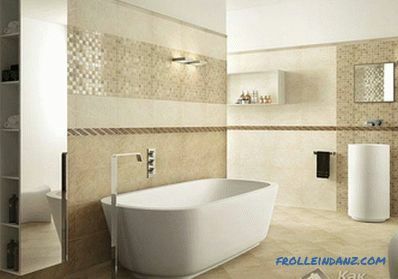 When choosing the color of the tile for a bath of small sizes, preference should be given to light shades. If you want to buy darker tones, then you should use them for facing the floor. Dark shades require more thorough care, as they will be more visible on dirt and stains. In the absence of the desire to carry out constant cleaning, it is worth refusing from dark glossy surfaces. For the floor is best suited matte tiles with imitation of natural stone. 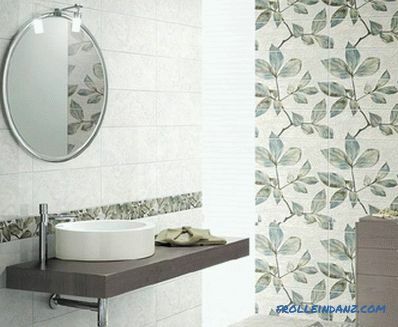 Walls with a complex configuration can be decorated with tiled mosaic. Bright colors are used to emphasize and highlight areas or interior decor. 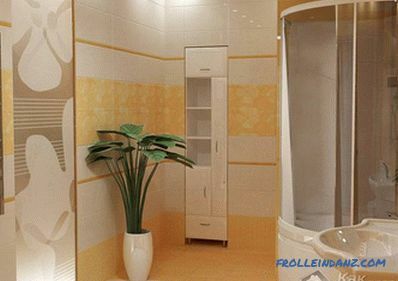 To simplify the process of choosing a tile in the bathroom, it is worth considering ready-made solutions from the manufacturer - these are collections of tiles. Combinations for decoration of walls, a ceiling, and also decorative elements are included in such sets: a panel and borders. The most effective in the bathroom will look marble tiles, for example, facing onyx. All the time spent on reviewing and choosing a tile model is more than compensated for by the incomparably long service life of a quality coating. I would also like to note that in order to get a beautiful and perfectly smooth surface, it is necessary to choose the right grout color for joints.